Niš (Serbian Cyrillic: Ниш, pronounced [nîːʃ] ( listen)) is the third largest city in Serbia and the administrative center of the Nišava District. According to the 2011 census[update], the city proper has a population of 187,544, while its administrative area has a population of 260,237 inhabitants. After about 400 years of Ottoman rule, the city was liberated in 1878 and became part of the Principality of Serbia, though not without great bloodshed—remnants of which can be found throughout the city. Today, Niš is one of the most important economic centers in Serbia, especially in the electronics, mechanical engineering, textile, and tobacco industries. Constantine the Great Airport is Niš's international airport. In 2013, the city was host to the celebration of 1700 years of Constantine's Edict of Milan. The town was named after the Nišava River, which flows through the city. It was first named Navissos by Celtic tribes in the 3rd century BC rom this term comes the Latin Naissus, the Greek Nysos and the Slavic Niš. Legend has it that Niš was founded by a certain Prince Nisa, who built it using the nearby Humska Čuka stone. The name is historically rendered as Nish or Nissa in English. Archaeological evidence shows Neolithic settlements in the city and its surroundings dating from 5,000 to 2,000 BC. [better source needed] A notable archaeological site is Humska Čuka, in the nearby settlement of Hum. In the Iron Age, theThracians dominated the region, with one of their chief settlements being the nearby Aiadava; specifically, the Triballi are mentioned as inhabiting this region as early as 424 BC. In 279 BC, during the Gallic invasion of the Balkans, the Celtic Scordisci defeated the Triballi and founded the city as Navissos. During the Roman conquest of the Balkans between 168 and 75 BC, the city, known as Naissus in Latin, was used as a base of operations. Naissus was first mentioned in Roman documents near the beginning of the 2nd century CE, and was considered a place worthy of note in the Geography of Ptolemy of Alexandria. It was besieged by the Huns in 441 and devastated in 448, and again in 480 when the partially-rebuilt town was demolished by the Barbarians. Byzantine Emperor Justinian I restored the town but it was destroyed by the Avars once again. The Slavs, in their campaign against Byzantium, conquered Niš and settled here in 540. In 805, the town and its surroundings were taken by Bulgarian Emperor Krum. In the 11th century Byzantium reclaimed control over Niš and the surrounding area. 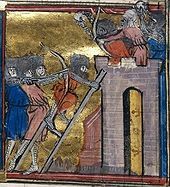 During the People's Crusade, on July 3, 1096, Peter the Hermit clashed with Byzantine forces at Niš. Manuel I fortified the town, but under his successor Andronikos I it was seized by the Hungarian king Béla III. Byzantine control was eventually reestablished, but in 1185 it fell under Serbian control. By 1188, Niš became the capital of Serbian king Stefan Nemanja. On July 27, 1189, Nemanja received German emperor Frederick Barbarossa and his 100,000 crusaders at Niš. Niš is mentioned in descriptions of Serbia under Vukan in 1202, highlighting its special status. In 1203, Kaloyan of Bulgaria annexed Niš. Stefan Nemanjić later regained the region. The fall of the Serbian Empire, which was conquered by Ottoman Sultan Murad I in 1385, decided the fate of Niš as well. After a 25-day-long siege the city fell to the Turks. It was returned to Serbian rule in 1443. Niš again fell under Ottoman rule in 1448, and remained thusly for 241 years. During Ottoman rule Niš was a seat of Turkish military and civil administration. A Silesian traveler stated in 1596 that the route from Sofia to Niš was littered with corpses and described the gates of Niš as bedecked with the freshly-severed heads of poor Bulgarian peasants. In 1689 Niš was seized by the Austrian army during the Great Turkish War, but the Turks regained it in 1690. In 1737, Niš was again seized by the Austrians, who attempted to rebuild the fortifications around the city. In that same year, however, the Turks would reclaim the city without resistance. During the First Serbian Uprising in 1809, Serbian revolutionaries attempted to liberate Niš in the famous Battle of Čegar. After the defeat of the Serbian forces, the Ottoman commander of Niš ordered the heads of the slain Serbs mounted on a tower to serve as a warning. The tower is known as the Skull Tower (Ćele Kula). In 1821, the Ottomans arrested the Bishop of Niš, Milentija, as well as 200 Serbian patriots, on charges of preparing an uprising in the Niš area in support of the Greek War of Independence. On June 13 of that year, Bishop Milentija and other Serbian leaders were hanged in public. In the 19th century Niš was an important town, but populated by Bulgarians in the 19th century, when the Niš rebellion broke out in 1841. According to Ottoman statistics during the Tanzimat the population of Sanjak of Niš was treated as Bulgarian and according to French travelers such as Jérôme-Adolphe Blanqui and Ami Boue in 1837/1841. According to all authors between 1840-72 the delineation between Bulgarians and Serbs is undisputed and ran north of Nis, although one author Cyprien Robert claims that half of the population of the town was made up by Serbians. The Serbian cartographers (such as Dimitrije Davidović in 1828 and Milan Savić in 1878) also accepted South Morava river as such delineation and added Niš outside the borders of the Serbian people. The urban Muslim population of Niš consisted mainly of Turks, of which a part were of Albanian origin, and the rest were Muslim Albanians and Muslim Romani. In 1870, Niš was included in the Bulgarian Exarchate., before the area had been under the Ecumenical Patriarchate of Constantinople and the Serbian Patriarchate of Peć. The city was also stipulated the area to be ceded to Bulgaria according to the Constantinople Conference in 1876. Niš was finally liberated during the Serbian-Turkish Wars (1876-1878). The battle for the liberation of Niš started on 29 December 1877 and the Serbian Army entered in Niš on 11 January 1878 and Niš became a part of the Serbian state. During the Serbian–Ottoman War (1876–1878) the Albanian neighbourhood was burned and some of the Muslim population of Niš fled to the Ottoman vilayet of Kosovo resettling in Pristina where they dominated trade while others went to Skopje. The number of remaining Muslims counted were 1,168, with many being Muslim Romani, out of the pre-war ca. 8,500. The demographics of Niš underwent change whereby Serbs who formed half the urban population prior to 1878 became 80 percent in 1884. In the following years, the city saw rapid development. The city library was founded in 1879, and its first clerk was Stevan Sremac. The first hotel, Europe, was built in 1879; shortly after a hospital and the first bank started operating in 1881. In 1878, the first Grammar School (Gimnazija), in 1882 the Teacher Training College, and in 1894, the Girls' College were founded in Niš. In 1895, Niš had one girls' and three boys' primary schools. The City Hall was built from 1882-87. In 1883, Kosta Čendaš established the first printing house. In 1884, the first newspaper in the city Niški Vesnik was started. In 1884, Jovan Apel built a brewery. A railway line to Niš was built in 1884, as well as the city's railway station; on 8 August 1884, the first train arrived from Belgrade. Since 1885, Niš was the last station of the Orient Express, until the railroad was built between Niš and Sofia in 1888. In 1887 Mihailo Dimić founded the "Niš Theatre Sinđelić." In 1897 Mita Ristić founded the textile factory Nitex. In 1905 female painter Nadežda Petrović established the Sićevo art colony. The first film was screened in 1897, and the first permanent movie theater started operating in 1906. Hydroelectric dam in Sićevo Gorge on Nišava was built in 1908; at the time, it was the largest in Serbia. The airfield was built in 1912 on the Trupale field, and the first airplane arrived on 29 December 1912. City Museum was founded in 1913, hosting archaeological, ethnographic and art collections. During the First Balkan War, Niš was the seat of The Main Headquarters of Serbian Army, who led the military operations against the Ottoman Empire. In World War I, Niš was the wartime capital of Serbia, hosting the Government and the National Assembly, until Central Powers conquered Serbia in November 1915, when the city was ceded to Bulgaria. After the breakthrough of the Thessaloniki Front, First Serbian Army commanded by general Petar Bojović liberated Niš on 12 October 1918. In the first few years after the war, Niš was recovering from the damage. In 1921, Niš became the centre of the Region (oblast), governed by a grand-župan, appointed by royal decree. From 1929-41, Niš was the capital of the Morava Banovina of the Kingdom of Yugoslavia. The tram system in Niš started to run in November 1930. The national airline Aeroput included Niš as a regular destination for the route Belgrade—Niš—Skopje—Thessaloniki in 1930. During the time of German occupation in World War II, the first Nazi concentration camp in Yugoslavia was in Niš. About 30,000 people passed through this camp, of whom over 10,000 were shot on nearby Bubanj hill. On 12 February 1942, 147 prisoners staged a mass escape. In 1944, the city was heavily bombed by the Allies. On 14 October 1944, after a long and exhausting battle, the 7th German SS Division 'Prinz Eugen' was defeated and Niš was liberated by Bulgarian Army, and Partisans. 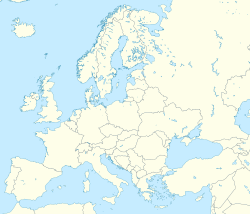 The city was also the site of a unique and accidental friendly fire air war on November 7, 1944 between the air forces of the United States and Soviet Union. On June 23, 1948, Niš was the site of a catastrophic flood during which the Nišava river's water level raised by an unprecedented 5.5 meters. After World War II, the University of Niš was founded on 15 June 1965. Over the course of the 1999 NATO bombing of Yugoslavia, Niš was subject to airstrikes on 40 occasions. On May 7, 1999, the city was the site of a NATO cluster bomb raid which killed up to 16 civilians. By the end of the NATO bombing campaign, a total of 56 people in Niš had been killed from airstrikes. In April 2012, the Russian-Serbian Humanitarian Center was established in the city of Niš. In December 2017, a new building of Clinical Centre of Niš spreading over 45,000 square meters was opened. The road running from the North, from Western and Central Europe and Belgrade down to the Morava River valley, forks into two major lines at Niš: the southern line, leading to Thessalonica and Athens, and the eastern one leading towards Sofia and Istanbul. Niš is situated at the 43°19' latitude north and 21°54' longitude east, in the Nišava valley, near the spot where it joins the South Morava. The main city square, the city's central part, is at 194 m (636 ft) above sea level. The highest point in the city area is "Sokolov kamen" (Falcon's rock) on the Suva Planina (Dry Mountain) (1,523 m (4,997 ft)) while the lowest spot is at Trupale, near the mouth of the Nišava (173 m (568 ft)). The city covers 596.71 square kilometres (230 sq mi) of five municipalities. Below Niska Banja and Nis, under the ground is a natural source of hot water, unique potential of clean and renewable geothermal energy at the surface of up to 65 square kilometers. The natural reservoir is at a depth of 500 to 800 meters, and the estimated capacity is about 400 million cubic meters of thermal mineral water. Average annual temperature in the area of Niš is 11.9 °C (53.4 °F). July is the warmest month of the year, with an average of 22.5 °C (72.5 °F). The coldest month is January, averaging at 0.6 °C (33.1 °F). The average of the annual rainfall is 580.3 mm (22.85 in). The average barometer value is 992.74 mb. On average, there are 134 days with rain and snow cover lasts for 41 days. 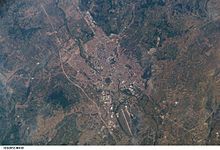 According to the final results from the 2011 census, the population of urban area of Niš was 183,544, while its administrative area had a population of 260,237. There is still much dispute about the true population of the city, since there are about 20,000 Kosovo and 2,000 other Yugoslav republics refugees who officially don't live in the city, but are living there with their local family members. With them, population of Niš is roughly 209,544 in city proper and 282,237 in administrative area. A total of 70.38% of the city’s population is living in urban areas. The city of Niš has 87,975 households with 2,96 members on average, while the number of homes is 119,196. Religion structure in the city of Niš is predominantly Serbian Orthodox (240,765), with minorities like Muslims (2,486), Catholics (809), Protestants (258), Atheists (109) and others. Most of the population speaks Serbian language (249,949). Female - 133,592 (42.81 years). A total of 120,562 citizens (older than 15 years) have secondary education (53.81%), while the 51,471 citizens have higher education (23.0%). Of those with higher education, 34,409 (15.4%) have university education. The city of Niš consists of five municipalities. 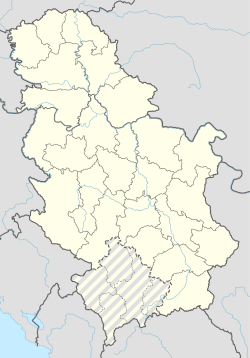 The first four municipalities are in the urban area of Niš, while Niška Banja is a suburban municipality. 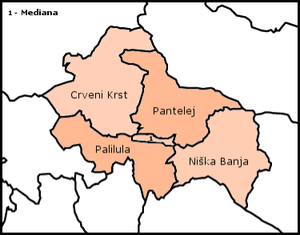 Before 2002, the city of Niš had only two municipalities, one of them named "Niš" and another named "Niška Banja". The city of Niš is the administrative, industrial, commercial, financial and cultural center of the south-eastern part of Republic of Serbia. The position of Niš is strategically important, at the intersection of European highway and railway networks connecting Europe with Asia. Niš is easily accessible, having an airport – Niš Constantine the Great Airport and being a point of intersection of numerous railroad and highway lines. Panorama picture of the Square of the King Milan I. These roads have been widely known from ancient times, because they represented the beaten tracks along which peoples, goods and armies moved. Known as 'Via Militaris' in Roman and Byzantine periods, or 'Constantinople road' in Middle Ages, these roads still represent major European traffic arteries. Niš thus stands at a point of intersection of the roads connecting Asia Minor to Europe, and the Black Sea to the Mediterranean. Nis had been a relatively developed city in the former Yugoslavia. In 1981, its GDP per capita was 110% of the Yugoslav average. As of September 2017, Niš has one of 14 free economic zones established in Serbia. Tinkers Alley, old urban downtown built in the first half of the 18th century. Niš is one of the most important industrial centers in Serbia, well known for its tobacco, electronics, construction, mechanical-engineering, textile, nonferrous-metal, food-processing and rubber-goods industries. Among the manufacturing companies which had a huge impact during the second half of 20th century on Niš's development are: EI Niš (electronics industry), Mechanical Industry Niš, "Građevinar" (construction company), Niš Tobacco Factory, "Nitex - Niš" (textile industry), "Niš Brewery" (beverages) and "Žitopek" (bakery). Other prominent companies which went bankrupt during the 1990-s and 2000-s are: "Vulkan" (rubber-goods manufacturer), "NISSAL" (nonferrous-metal industry). Prominent tobacco manufacturer "Niš Tobacco Factory" was sold to Philip Morris in August 2003 for 518 million euros. Niš is strategically between the Morava river valley in North and the Vardar river valley in the south, on the main route between Greece and Central Europe. In the Niš area, this major transportation and communication route is linked with the natural corridor formed by the Nišava river valley, which runs Eastwards in the direction of Sofia and Istanbul. The city has been a passing station for the Orient Express. The first highways date back to the 1950s when Niš was linked with capital Belgrade through the Brotherhood and Unity Highway, the first in Central-Eastern Europe. Historically, because of its location, the city had always great importance in the region. The first to take advantage of it was the Roman Empire that built the important road Via Militaris, linking the city with Singidunum (current Belgrade) to the North and Constantinople (current Istanbul) to the southeast. Nowadays, the city is connected by the highway E75 with Belgrade and Central Europe in north, and Skopje, Thessaloniki and Athens in the south. The road E80 connects Niš with Sofia, Istanbul towards the Middle East, and Pristina, Montenegro and the Adriatic Sea to the West. The road E771 connects the city with Zaječar, Kladovo and Drobeta-Turnu Severin in Romania. The city is also a major regional railway junction linking Serbia to Sofia and Istanbul. The Niš Constantine the Great airport is the second most important airport in Serbia. The first airfield serving the city of Niš was established in 1910, near the village of Donje Međurovo. In the 1930s then-national airline company Aeroput used the airport for civil service. In 1935 Aeroput included a stop in Niš in its route linking Belgrade with Skoplje. The city public transportation consists nowadays of 13 bus lines. A tram system existed in Niš between 1930 and 1958. Niš Bus Station is the city's largest and main bus station which offers both local urban and intercity transport to international destinations. The largest intercity bus carrier based in the city is Niš-Ekspres, which operates to various cities and villages in Serbia, Montenegro, and Bosnia and Herzegovina. The Film Festival – a Festival of Serbian Actors held since 1966. Niš is a home of the National Theatre in Niš, that was founded as "Sinđelić" Theatre in 1889. From 1981 Niš is the host of Nišville International Jazz music festival which begins in mid-August and lasts for 4 days. Galija, Kerber and Eyot are considered the most notable music bands to have originated from Niš. Other notable Niš music acts include Daltoni, Dobri Isak, Lutajuća Srca, Mama Rock, Hazari, Novembar, Trivalia and others. Čegar – The place where Battle on Čegar Hill took place on 19 May 1809. Crveni Krst concentration camp – One of the few preserved Nazi concentration camps in Europe. It is on 12 February Boulevard. Memorial to Constantine the Great – built in the city centre in 2013, in commemoration to Constantine the Great who was born in the city, on the anniversary of the Edict of Milan. Bubanj – Monument to fallen Yugoslav World War II fighters, forming the shape of three clenched fists. The place where 10,000 civilian hostages from Niš and south Serbia were brutally murdered by German Nazis. Kalča, City passage and Gorča – Trade centers situated in Milana Obrenovića Street. 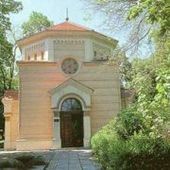 Memorial Chapel in the memory of NATO bombing victims - The chapel was built by local authorities while the monument was built by the State government in 1999. They are situated in Sumatovacka street near Niš Fortress. Niš Fortress - The remaining fortification was built by the Turks, and dates from the first decades of the 18th century (1719–23). It is situated in the city center. The fortress-cafes - They are situated near Stambol gate (the main gate of the fortress). Mediana - Archeological site, an Imperial villa, from the late Roman period on the road leading to Sofia, Bulgaria, near EI Nis. Niška Banja (Niš spa) - A very popular spa during the summer season. It is 10 km (6 mi) from city center on the road leading to Sofia, in the bottom of Suva Planina Mountain. Tinkers Alley - An old urban downtown zone in today's Kopitareva Street, built in the first half of the 18th century. It was a street full of tinkers and other craftsmen, but today it is packed with cafes and restaurants. Skull Tower (Ćele Kula) - A monument to the Serbian revolutionaries (1804–13); a tower made out of skulls of Serbian uprisers, killed and decapitated by the Ottomans. It is situated on Zoran Đinđić Boulevard, on the old Constantinople road leading to Sofia. Sultans Trail Long distance hiking and biking route from Vienna to İstanbul runs through Niš. Čair Sports Center hosted the group stage of 2012 European Men's Handball Championship. The city of Niš is home to numerous sport clubs including Železničar Niš, Mašinac, OFK Niš, Jastrebac Proleter, Palilulac, Sinđelić Niš and Radnički Niš. The biggest stadium in Niš is the Stadion Čair, which is currently undergoing renovations and will have a total seating-capacity of 18,151 when renovations are completed. The stadium is part of the Čair Sports Complex that also includes an indoor swimming pool and an indoor arena. Niš was one of four towns which hosting the 2012 European Men's Handball Championship. Nikola Uzunović, (b. 1873), prime minister of Kingdom of Yugoslavia from 1926 to 1927. Dušan Radović (1922–84), journalist and writer. Nadja Regin, (b. 1931), actress. Goran Paskaljević (b. 1947), movie director; raised by his grandparents in Niš 1949-63, after the divorce of his parents. Eva Haljecka Petković (1870–1947), doctor. Aleksandar Šoštar (b. 1964), water polo goalkeeper, Olympic, World and European champion. Dragan Stojković (b. 1965), football player, Olympic bronze medalist. Branislava Ilić (b. 1970), playwright, screenwriter, prose writer, essayist. Ivan Miljković (b. 1979), volleyball player, Olympic and European champion. Bojana Popović (b. 1979), Montenegrin handball player, Olympic silver medalist. Nikola Karabatić (b. 1984), French handball player, Olympic, World and European champion. Ivan Kostic (b. 1989), footballer. Stefan Jović (b. 1990), basketball player, Olympic, World Cup and EuroBasket silver medalist. Sava Ranđelović (b. 1993), water polo player, Olympic, World and European champion. Andrija Živković (b. 1996), footballer, U-20 World champion. ^ Protić, Stojan. Niš-Second Capital. Niš: Prosveta. ^ "2011 Census of Population, Households and Dwellings in the Republic of Serbia: Comparative Overview of the Number of Population in 1948, 1953, 1961, 1971, 1981, 1991, 2002 and 2011, Data by settlements" (PDF). Statistical Office of Republic Of Serbia, Belgrade. 2014. p. 84-87. ISBN 978-86-6161-109-4. Retrieved 2014-06-27. ^ "The refugees from Kosovo and former SFRY countries are getting money for their own business". Južne vesti. 8 September 2017. ^ a b "City of Nis". Ni.rs. Archived from the original on 2012-02-20. Retrieved 2013-02-18. ^ "Latest news, Latest News Headlines, news articles, news video, news photos - UPI.com". Metimes.com. 2013-02-14. Archived from the original on September 29, 2007. Retrieved 2013-02-18. ^ "Moderate Patriarch Sets New Course for Serb Church". IPS News. 2010-02-01. Archived from the original on 2010-02-10. ^ "Nis". Britannica.com. Retrieved 2013-02-18. ^ a b Syme, Ronald (1999). The provincial at Rome: and, Rome and the Balkans 80BC-AD14, p. 207. ISBN 9780859896320. Retrieved 2013-02-18. ^ "BALCANICA XXXVII" (PDF). Balkaninstitut.com. Retrieved 29 December 2017. ^ "Decline and Fall of the Roman Empire, Vol. 2: Chapter XXV: Reigns Of Jovian And Valentinian, Division Of The Empire. Part II". Sacred-texts.com. Retrieved 2013-02-18. ^ Fine, John V. A.; Fine, John Van Antwerp (29 December 1991). The Early Medieval Balkans: A Critical Survey from the Sixth to the Late Twelfth Century. University of Michigan Press. ISBN 978-0472081493. Retrieved 29 December 2017 – via Google Books. ^ Kultur der Nationen (in German). p. 110. ^ Chalcraft, John (2016-03-22). Popular Politics in the Making of the Modern Middle East. Cambridge University Press. ISBN 9781107007505. ^ "Ottoman Bulgaria in the First Tanzimat Period — The Revolts in Nish (1841) and Vidin (1850) Mark Pinson, Middle Eastern Studies, Vol. 11, No 2 (May, 1975), pp. 103-146". Promaxedonia.org. Retrieved 29 December 2017. ^ a b Light, Andrew; Smith, Jonathan M. (1998). Philosophy and Geography II: The Production of Public Space. Rowman & Littlefield. pp. 240, 241. ISBN 9780847688104. ^ "Engin Deniz Tanir, October 2005, Middle East Technical University, Ankara, p. 70" (PDF). Etd.lib.metu.edu.tr. Retrieved 29 December 2017. ^ Savić, Milan (1981). "Istorii︠a︡ na bŭlgarskii︠a︡ narod". google.bg. ^ a b Jagodić, Miloš (1998). "The Emigration of Muslims from the New Serbian Regions 1877/1878". Balkanologie. 2 (2). para. 6. "According to the information about the language spoken among the Muslims in the cities, we can see of which nationality they were. So, the Muslim population of Niš and Pirot consisted mostly of Turks; para. 11. "The Turks have been mostly city dwellers. It is certain, however, that part of them was of Albanian origin, because of the well-known fact that the Albanians have been very easily assimilated with Turks in the cities. "; para. 23, 30, 49. ^ a b c Geniş, Şerife; Maynard, Kelly Lynne (2009). "Formation of a Diasporic Community: The history of migration and resettlement of Muslim Albanians in the Black Sea Region of Turkey". Middle Eastern Studies. 45 (4): 556. doi:10.1080/00263200903009619. "that the Muslim Albanians of Nish were forced to leave in 1878, and that at that time most of these Nishan Albanians migrated south into Kosovo, although some went to Skopje in Macedonia." ^ Encyclopedia of the Ottoman Empire Facts on File library of world history, Gábor Ágoston, Bruce Alan Masters, Infobase Publishing, 2009 ISBN 1438110251, P. 104. ^ Judah, Tim (2008). Kosovo: What everyone needs to know. Oxford: Oxford University Press. p. 35. ISBN 9780199704040. "This was the year that saw Serbia expanding southward and taking Nis. The Albanian quarter was burned and Albanians from the surrounding villages forced to flee." ^ Jagodić, Miloš (1998). "The Emigration of Muslims from the New Serbian Regions 1877/1878". Balkanologie. 2 (2). Before the war, there were about 8 500 Muslims in Niš. 1 168 of them were listed in the first Serbian inventory in 1879. 797 Gypsy Muslims were probably included in that number95. According to the stated data, approximately 7 332 Muslims moved out from Niš. ^ Stefanović, Djordje (2005). "Seeing the Albanians through Serbian eyes: The Inventors of the Tradition of Intolerance and their Critics, 1804–1939". European History Quarterly. 35 (3): 465–492. doi:10.1177/0265691405054219. "Prior to 1878, the Serbs comprised not more than one half of the population of Nis, the largest city in the region; by 1884 the Serbian share rose to 80 per cent." ^ "Chronology". Ni.rs. Archived from the original on 2013-02-18. Retrieved 2013-02-18. ^ Christopher Chant. The Encyclopedia of Codenames of World War II (Routledge Revivals; 2013); ISBN 1134647875, p. 209. ^ Elisabeth Barker et al., British Political and Military Strategy in Central, Eastern and Southern Europe in 1944, Springer (1988); ISBN 1349193798, p. 249. ^ Jozo Tomasevich. War and Revolution in Yugoslavia: 1941-1945, Volume 2, Stanford University Press (2001); ISBN 0804779244, p. 156. ^ Milan Novaković (August 1, 2008). "Niškevesti.rs: Katastrofalna poplava u Nišu juna 1948. godine" (in Serbian). Retrieved August 10, 2017. ^ a b c D. Stojanović (May 7, 2015). "Novosti: Suze za 16 žrtava kasetnih bombi" (in Serbian). Retrieved August 10, 2017. ^ "Otvoren Klinički centar u Nišu, došli Vučić, Brnabić..." b92.net (in Serbian). Tanjug. 17 December 2017. Retrieved 17 December 2017. ^ "Jezero tople vode ispod Niša". Politika.rs. Retrieved 29 December 2017. ^ "Monthly and annual means, maximum and minimum values of meteorological elements for the period 1981-2010" (in Serbian). Republic Hydrometeorological Service of Serbia. Retrieved February 25, 2017. ^ "Station Nis" (in French). Meteo Climat. Retrieved November 11, 2017. ^ "2011 Census of Population, Households and Dwellings in the Republic of Serbia" (PDF). stat.gov.rs. Statistical Office of the Republic of Serbia. Retrieved 11 January 2017. ^ a b "2011 Census of Population, Households and Dwellings in the Republic of Serbia: Comparative Overview of the Number of Population in 1948, 1953, 1961, 1971, 1981, 1991, 2002 and 2011, Data by settlements" (PDF). Statistical Office of Republic Of Serbia, Belgrade. 2014. ISBN 978-86-6161-109-4. Retrieved 2014-06-27. ^ "Number and the floor space of housing units" (PDF). stat.gov.rs (in Serbian). Statistical Office of the Republic of Serbia. Retrieved 21 March 2018. ^ a b c "Religion, Mother tongue, and Ethnicity" (PDF). stat.gov.rs (in Serbian). Statistical Office of the Republic of Serbia. Retrieved 21 March 2018. ^ "Educational attainment, literacy and computer literacy" (PDF). stat.gov.rs (in Serbian). Statistical Office of the Republic of Serbia. Retrieved 21 March 2018. ^ "Ethnicity" (PDF). stat.gov.rs. Statistical Office of the Republic of Serbia. Retrieved 23 April 2017. ^ "ОПШТИНЕ И РЕГИОНИ У РЕПУБЛИЦИ СРБИЈИ, 2018" (PDF). stat.gov.rs (in Serbian). Statistical Office of the Republic of Serbia. Retrieved 2 February 2019. ^ ""Filip Moris" kupuje DIN, BAT kupuje DIV". b92.net (in Serbian). 5 August 2003. Retrieved 18 October 2018. ^ "Istorijski Arhiv Niš". Arhivnis.co.rs. Archived from the original on 27 October 2012. Retrieved 18 February 2013. ^ ""Radovi na stadionu idu po planu" : Sport : Južne vesti". Juznevesti.com. Retrieved 2013-02-18. ^ "Južne vesti - Leskovac, Niš, Pirot, Prokuplje, Vranje - vesti iz južne Srbije". Južne vesti. ^ "Super Radio". Super Radio Niš. ^ a b "belami.rs - najnovije vesti, vesti iz Niša, vesti iz Srbije". Belle Amie. ^ Banker. "TV BANKER". bankerinter.net. Archived from the original on 2006-06-15. Retrieved 2006-05-02. ^ "RTV5 - Nis -". rtv5.rs. ^ "ck0M1". medianis.net. Archived from the original on 2007-06-10. ^ "Televizija Kopernikus TV K::CN". tvkcn.net. Archived from the original on 2012-01-26. Retrieved 2012-01-20. ^ a b c d e f g h i j k l m n o "Niš Twinnings". Niš City Hall. Retrieved 2008-04-17. ^ "Twin cities of the City of Kosice". Magistrát mesta Košice, Tr. Retrieved 2013-07-27. Wikimedia Commons has media related to Niš. Wikivoyage has a travel guide for Nis.